It happens to all courgette growers. Turn your back for a day or so and the small, delicate fruits transform into gigantic marrows. They take over your plot, they take over your fridge. You kid yourself that courgette soup is nice, then you realise it isn’t. You throw them on the compost heap. The gardener needs a strategy for dealing with late summer’s abundance of produce, and for making use of those courgettes that got away. 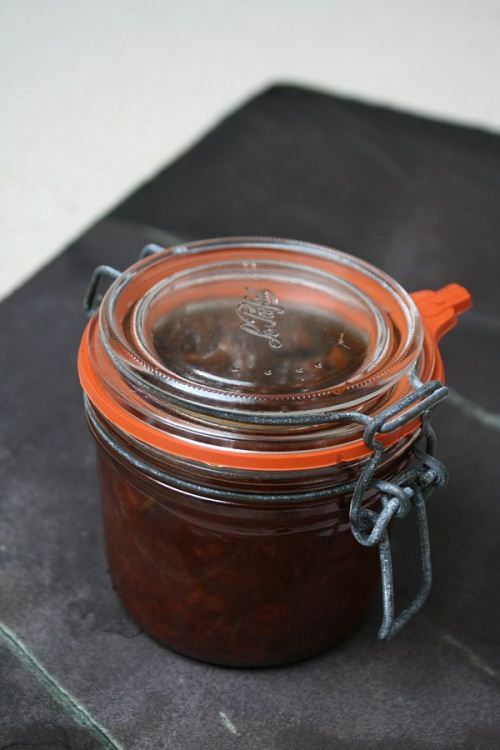 This chutney, Hugh Fearnley-Whittingstall’s unparalleled recipe, is an excellent way of disposing of at least a kilo each of apples, plums and mutant courgettes. If prepared properly, in sterile conditions, it should last at least a year. If you make it in September, it will have matured nicely in time for that all important Boxing Day turkey sandwich. Chop a kilo of courgettes into centimetre square chunks, discarding the seeds in the middle. Dice a kilo of cored and peeled apples into similar sized chunks and stone and quarter a kilo of plums, or use a kilo of green tomatoes instead. Place the fruit and veg in a large pan. Add 500g each of chopped onions and raisins or sultanas to the pan, along with 500g of light brown sugar, a teaspoon of salt and one or two teaspoons of dried chilli flakes. Pour 750ml of white wine or cider vinegar into the pan, with 250g of water. Make a spice bag out of a small square of muslin, and add a thumb sized piece of ginger, bashed to bruise it a little, a tablespoon of black peppercorns, a tablespoon of coriander seeds and a few blades of mace. Push the spice bag down into the middle of the pan and set it on a medium heat, uncovered. Let the chutney cook gently for at least three hours. It will darken, and thicken very gradually, and will fill your kitchen with a wonderful smell. Keep stirring every now and again to stop the chutney catching on the bottom of the pan. A bit of sticking is inevitable, but if it really catches, just tip the contents into a clean pan and start scrubbing the dirty one. It’ll take days to clean. The chutney is ready when you can draw a wooden spoon through it and leave a wake behind. When ready, ladle the chutney into sterilised jars and put the lids on tightly. A wide necked funnel will really help. Chutneys like this are best enjoyed with a piece of cheese, some bread and a thick doorstep sized slice of pork pie, but they can be a useful ingredient in their own right. The general idea behind chutney, and indeed the name, originates from the Indian sub-continent, and many of the spices involved have a distinct Indian tinge to them. A couple of tablespoons can bring some life and body to an impromptu curry. Well worth having a jar or two tucked away in the cupboard. Thanks Richard. Mrs P made some decent chutney this time last year but the house stank for days afterwards. I'll pass this recipe on to her. I'm always looking for ways to deal with 'gluts' and this is a good one. Thanks for sharing. I dont have much growing room on my balcony, but my Dad has had a massive glut of Damsons. He has already made jam with 14kilos of the fruit, and sent me back up on the train to Leeds with another 2kg to make into damson gin and brandy, and there is still another 50 or 60 kilos left on the tree! It seems a shame to let it rot, but how many damsons can you really eat! Thank you for sharing. Cheers ! I have yet to make some chutney, I keep reading about chutney and seeing it pop up in a lot of recipes. I'm going to bookmark this one for feature references!